A massive starship has just teleported into the Justice League Watchtower leaving dozens of people dead or injured. Superman is not about to give up but at this point he really needs to be at full power. Wonder Woman is in the Watchtower but is quickly taken into custody by Frankenstein and Vandal Savage, who informs Superman that he is going to take his friends' powers just as he took Superman's. Savage releases Wrath's Black Mass on the city while Superman tries to save a bus from crashing off of a bridge. 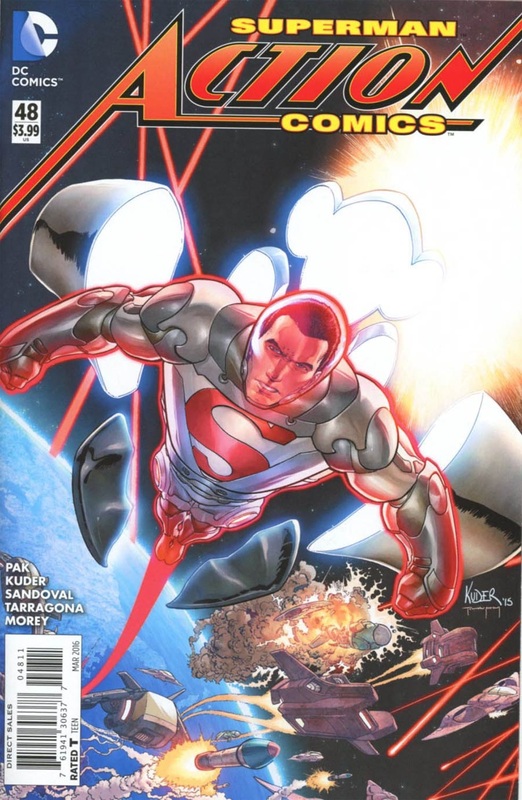 Justice League United arrives and soon Superman is reunited with Steel and Lana and is told that the armor they have been working on is not ready. It is based on the same technology as the Metal-0 armor, which was powered by Kryptonite and would kill a normal man in minutes. As it stands Superman will only last a few hours, which is just fine by Clark. Wrath is horrified that so many people are dying, which doesn't mean a thing to Vandal Savage who is only looking for a clan that will have the strength and will to do what must be done. Superman and the Justice League United are able to break back into the Watchtower and Superman frees Diana. Savage is about to kill the two heroes when Wrath attacks him from behind. There is a massive explosion which blows Superman and Wonder Woman outside of the Watchtower and they crash to the ground. Savage has survived the attack and is informed that the breach is being repaired and that they only lost one subject but acquired six more. Vandal now has everything he needs for his final strike. Story - 3: The first thing that I liked about this issue is that despite the fact that I haven't read any of the other chapters in the SAVAGE DAWN storyline I never once felt lost. The exposition was blended seamlessly into the story which allowed the issue to hit the ground running and never get mired in bringing the audience up to speed. I would have appreciated a little something on the cover telling me this was part of the SAVAGE DAWN storyline but that's a fairly minor complaint. It was nice seeing Steel and Lana again, even if that only lasted a few pages. Superman is now free of the plot device that had him acting all angry and outraged and we got some moments that were there at the beginning but got lost in the whole Black Mass thing. Despite not having super powers Superman is acting like Superman, not some frat boy that just bought a Superman T-shirt at Hot Topic or Target. I am aware that Superman acting the way he did was part of the story and not reflective of who Superman is. He was being drugged. I get that. It's a cop out but I get it. The bit that made me actually enjoy the issue was when Superman put on the armor that he knew would slowly kill him but give him the power he needed to get the job down. It was a dramatic moment where, again, I felt that Superman was acting like Superman. Selfless and not really caring about his own safety to save people. It could be argued that the act was hollow because he has few ties to the outside world. Superman had nothing to lose, but I dismissed that as soon as it occurred to me because I realized it was such a pedantic argument that it needed no further examination. Other than the feeling that Wrath turning on Savage was a little forced, this issue was definitely a step up from what we have been getting. I haven't changed my mind that TRUTH was ill conceived and then, for the most part, botched in execution but now that it's winding down I'm feeling less angry about the whole thing. That doesn't mean I liked this chapter of SAVAGE DAWN but it does mean that this issue went down a lot smoother than the last few. Art - 4: My only true issue with the art this time out is the coloring. I realize that the color of the skies in the outside scenes was intentional but it was hard on the eyes, or at least my eyes. Other than that it's nice to see Kuder back on art duties. I liked the fact that his style and Sandoval's style were similar enough to make for a smooth reading experience. Then again the Superman books have been really good about that since the start of the New 52 so I expected no less. Cover Art - 4: This is a very dynamic and exciting cover. 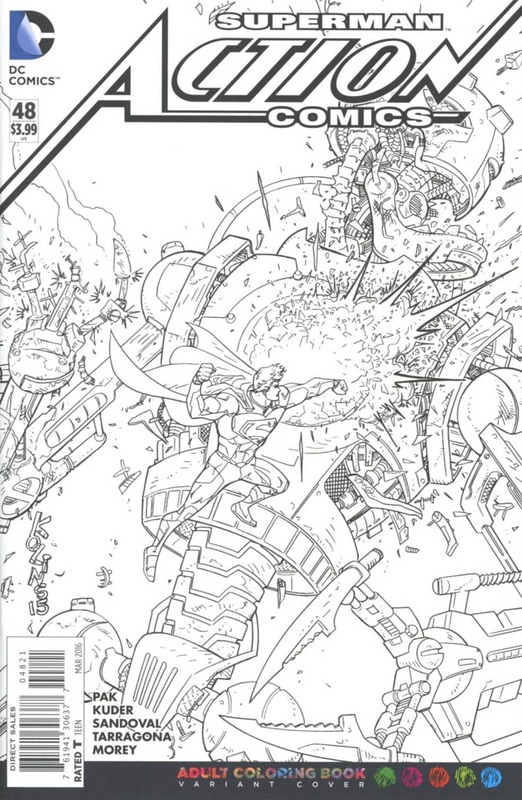 Superman looks great flying towards the camera in his suit with an amazing space battle going on behind him. This is the first cover that has really grabbed me in the last few months. Variant Coloring Book Cover Art - 4: Superman looks a little strange but otherwise this is a fun variant cover. My wife has recently gotten into the whole adult coloring book thing so it's neat to see our worlds crossover however tangentially.